What is the impact on homeowners, businesses, retirement, and taxes? Mortgages: While rates may be lower, there will be more fees imposed on mortgages. Lenders will be far more cautious in lending, and people who cannot meet their mortgages are likely to lose these homes. This may create a “contrarian” plays in foreclosures and vacation homes..
Stocks and Other Investments: Is now the time to get into the stock market or is it safer to stick with CDs, bonds, and gold? He will offer insight into these areas and many others, including how the structure of the bailout bill allows for unprecedented authority that has altered the financial landscape, perhaps permanently. 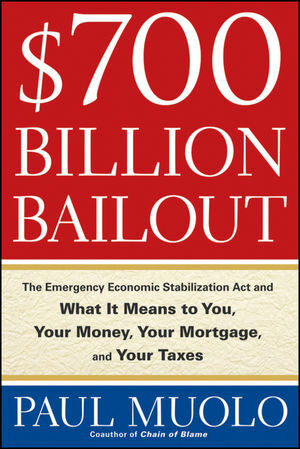 Will the plan work, and how we can prevent this from happening again remains to be seen, but with $700 Billion Bailout Paul Muolo gives us a critical tool for deciphering perhaps the most sweeping piece of legislation since the Patriot Act. Paul Muolo is Executive Editor of National Mortgage News and coauthor of the eye-opening Chain of Blame, which has received very strong coverage in both print and online. His freelance work has appeared in the New York Times, the Washington Post, and Barron's. Muolo has been a guest financial expert on numerous media outlets, including CNN, CNBC, ABC, and Fox Business Network.